Flying saucers, flat-head whales and bucking broncos on this fabulous and fantastic Barok'n'roll wallpaper from WallCollection. 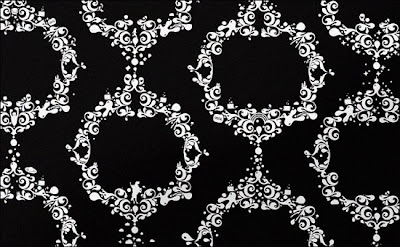 Designed by artist and skateboarder Emil Kozak in black on white, white on black or white on red, it's a neat twist on a classic Baroque wall covering. All the usual ornamental flourishes are, in fact, tiny details: here a diamond, there a skull, over there a heart. Once you start looking you'll spend hours examining the paper. WallCollection are a Danish company but you can buy their products throughout Europe and the US, too. Their product differs from traditional wallpaper in that it is digitally printed allowing for a more flexibility in design, a larger color palette, no pattern repeat and no wastage. The added bonus for those of us who want something unique - you can upload your own photo to their website and they'll create your custom wallpaper. The feature also allows you to price the wallpaper out and see what it looks like before you decide to purchase. Just measure the height and width of the wall you want to decorate (in centimeters, please) and use the online calculator to do the hard work for you. As a rough guide n 8'high 10' long wall will run somewhere between $700 and $1500 depending whether you use on of their designs or one of your own.